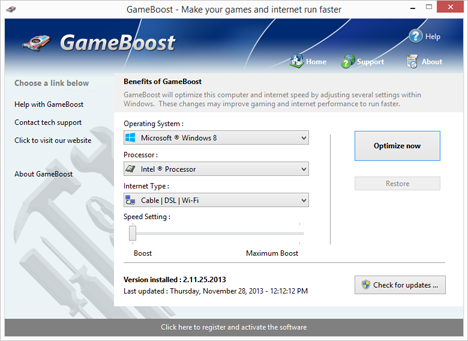 GameGain sets the standard for PC gaming optimization software. 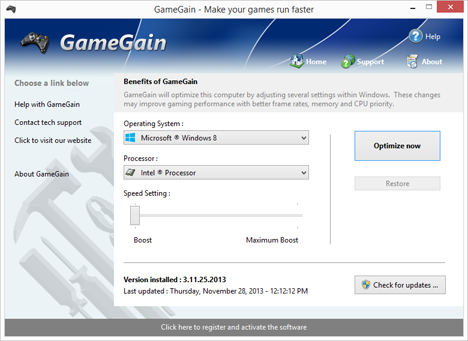 GameGain instantly increases the performance of your computer and squeezes out every last bit of performance your computer gaming hardware is capable of. With many of the latest PC games requiring high hardware requirements to have a suitable gaming experience, it is important to optimize your computer's performance. Windows is a general operating system which is used for many everyday tasks; it is not optimized for gaming performance. With GameGain and a few clicks of your mouse, you will notice an increase in frames per second, smooth game play and less lag during gaming. 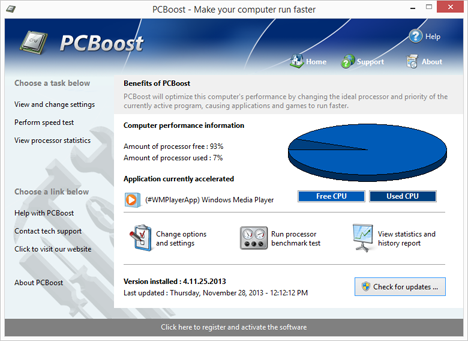 PC Boost — a program for automatic release of computer resources for running the application. The program will allow you to run applications such as computer games, software for video editing photos much faster than it would be without the use of PC Boost. The utility automatically takes over the task of allocating more processing power for specific applications, so that applications running faster. The program runs as a system service on Windows and automatically monitors and prioritize CPU for each running application. Latest version supports Windows 7. 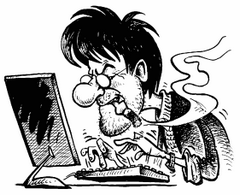 Many programs and games often use a minimal amount of CPU power which often leads to a simple processor. PGWare SuperRam — this utility will significantly increase the efficiency of your system performance by freeing memory. The program runs in the background, has a very large number of settings. By passing it, has an intuitive and user friendly interface so that even a beginning user will not have problems when using this program.